Floss your teeth once a day in order to clean the sides of the teeth where the toothbrush won’t reach (which amounts to 40% of your tooth). 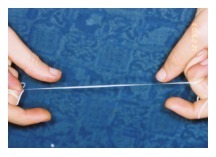 Wind the floss around your middle fingers so that you can hold it taught, then slide it in between your teeth. Curve it around one tooth and move it in an up-and-down motion a few times. Don’t move the floss in-and-out; you’re not trying to saw through jail bars here. Once you get that tooth cleaned, curve the floss around the neighboring tooth, do the same motion a few times, then pull the floss out and move on to the next in-between area. You should also be sure to get around the back side of the very last tooth in each corner of your mouth. Once you get a routine, the whole thing shouldn’t take longer than 1-2 minutes. Don’t know which kind of floss to use? It doesn’t matter, just do it–that’s the important thing. Also, you’ll hear differing opinions about whether you should floss before you brush or after. Again, no studies have been done to show a significant difference. The important thing is that you floss at all.